As you may know, I love making classic desserts with a twist! Last year I made a trifle with traditional flavours but a slightly different presentation – a Trifle Slice. 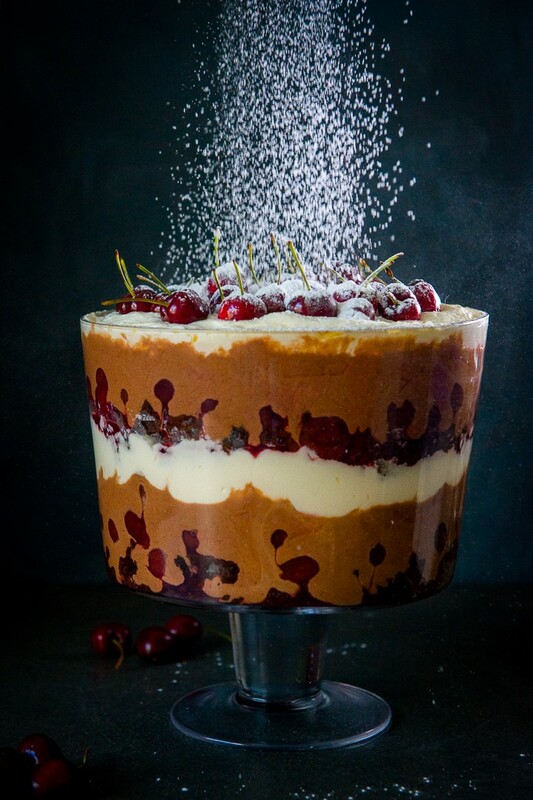 This year I wanted to make use of the delicious flavour combination of chocolate and cherries but layer it up in the traditional way and make a Black Forest Trifle. I was so happy with the result! The rich flavours of dark chocolate and black cherries give this dessert a grown-up revamp, and I think the contrast of colours looks great too. With fresh cherries in season now, it’s a great time to use them in Christmas desserts. Not only do they taste sweet and juicy, but they make any dessert look gorgeous and striking. I can’t get enough of their shiny scarlet colour! Feel free to make your trifle a couple of days in advance, and if you’re pressed for time go ahead and use shop-bought brownies (I won’t tell!). Preheat your oven to 180°C. Grease and line two 20cm square baking tins with greaseproof paper, leaving the edges long so that the paper sticks out the top. Cream together butter and brown sugar for 3-4 minutes. Add the vanilla and beat well. Beat in the eggs one at a time and mix together very well. Sift together the remaining ingredients and gradually beat into the creamed mixture until well combined. Divide the mixture between the two tins and smooth the top with a palette knife. Bake the brownies for about 30 minutes, or until cooked through but still soft. Allow to cool in the tin for 10 minutes, then lift out using the greaseproof paper edges. Leave to cool completely. For the cherry layer, empty the contents of both tins into a medium saucepan. Stir in the castor sugar, lemon juice and cornflour. Heat the mixture on low heat, stirring frequently, until the mixture comes to a boil and thickens. Continue heating for 1 min, stirring constantly, then remove from the heat and allow to cool at room temperature. Refrigerate until needed. To make the chocolate custard, beat together the egg yolks, sugar and flour. Heat the cream and milk in a medium saucepan on medium heat until just starting to boil. Pour the hot cream mixture onto the egg yolk mixture in a thin stream, whisking constantly to avoid scrambling the eggs. Strain the mixture back into the saucepan and heat on a low heat, stirring constantly until the custard has thickened. Cover the surface of the custard with clingfilm and leave to cool at room temperature. Refrigerate until ready to assemble. For the Chantilly Cream, beat the cream, sugar and vanilla essence together until stiff peak stage. Fold 1 cup of this into the cooled chocolate custard. Refrigerate the remaining chantilly cream until needed. To assemble the trifle, break up half the brownies into medium pieces and arrange in a layer at the bottom of a large trifle dish. Gently press down to make it fairly even. Drizzle with 30ml cherry liqueur if desired. Spoon over half the cherry sauce, then half the chocolate custard, then half the chantilly cream. Repeat this with the remaining ingredients, finishing with a layer of Chantilly cream. Refrigerate until ready to serve, then decorate with fresh cherries. Astrid, this looks totally decadent and delicious. I am making it for New Year to wow friends! Thank you.